SEOUL — With a blue pen, Dr. Seo Young-tae drew arches on Chang Hyang-sook’s eyelids, marking where to cut and stitch to create a new fold to make her eyes look larger and rounder. It is an operation so common here that most women on Seoul streets seem to have a double fold, though only one of every five Koreans is born with one. Chang Hyang-sook, a makeup artist, paid the 2.3 million won, or about $2,000, to make her eyes look larger and rounder. For Ms. Chang, 25, a makeup artist, the 2.3 million won, or about $2,000, eye job is just the finishing touch in a program several months long to remake her face. In the previous two months, Ms. Chang had not only had her teeth rearranged, but her jaw bones cut and repositioned, for 22 million won. Cosmetic surgery has long been widespread in South Korea. But until recently, it was something to keep quiet about. No longer. And as society has become more open about the practice, surgeries have become increasingly extreme. 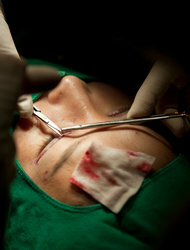 Double-jaw surgery — which was originally developed to repair facial deformities, and involves cutting and rearranging the upper and lower jaws — has become a favorite procedure for South Korean women who are no longer satisfied with mere nose jobs or with paring down cheekbones to achieve a smoother facial line. Celebrities have helped to drive the trend, as they scramble to keep ahead of digital technology that mercilessly exposes not only their physical imperfections, but any attempts to remedy them, said Rando Kim, a professor of consumer science at Seoul National University. That, in turn, has encouraged greater openness among ordinary South Koreans. Dr. Park’s is a top-ranked clinic in Seoul’s “beauty belt,” a swarm of hundreds of plastic surgery clinics clustered around a string of subway stations in the upscale districts of southern Seoul. Parents may promise their daughter an eye job if she passes her college entrance exam. In Apgujeong, it is not hard to find young women shopping in department stores immediately after their surgeries, wearing masks or sunglasses. “Korean women want a revolution with their face,” said Dr. Park, a leading practitioner of double-jaw surgery. In traditional Korea, tampering with the body bestowed by one’s parents was a violation of Confucian precepts that also discouraged cremation and, later, organ and blood donations. But in recent decades, cosmetic surgery has become a weapon in Koreans’ efforts to impress others, “like buying an expensive handbag,” said Whang Sang-min, a psychologist at Yonsei University. Cosmetic surgery is not covered by national health insurance, making it difficult to determine the exact size of the industry. A survey last year by the Seoul city government found that 31.5 percent of residents 15 or older were willing to undergo surgery to improve their looks. In 2007 the percentage was 21.5. In a 2009 survey by the market research firm Trend Monitor, one of every five women in Seoul between the ages of 19 and 49 said they had undergone plastic surgery.